Our Amerimax windows reviews include opinions from consumers, homeowners, contractors and industry professionals. Read opinions on Amerimax products, customer service, how they compare to other leading brands and more. 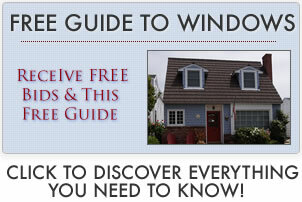 For additional pricing information, use our free window replacement cost calculator. Amerimax is considered more of a regional, high quality manufacturer. Here are some standard hardware features on most products 36″ or larger – super spacers, triple weatherstripping, double strength glass, tilt ins on their single hungs, brass rollers, 8 vinyl & sloped chambers, 4 weep holes and 2 cam locks. They offer a bunch of grid options, 10 exterior frame color choices and low-e270 & argon fills on their standard glass package. The glass is a great feature as it qualifies for tax rebate, where many others require an upgrade to qualify. The Tuscany by Milgard is a solid choice, significantly better than their Classic line, but inferior in lots of ways to the Amerimax. On the Milgard Classic (they don’t yet offer the Tuscany) they offer a plastic handle on the outside, no footbolt lock option, an upgrade to a key lock and 3 handle finish options. Again, I don’t think it measures up to the Amerimax door. I will say this – Milgard has excellent marketing. Pricewise, you are going to pay more for the Amerimax product, both on the windows and the doors. The doors are going to be a lot more expensive. Amerimax is also going to be harder to find dealers for their products, where Milgard is a national brand with many dealers across every section of the country. As far as windows, if neither one of these products is available or convenient, a comparable window is the Simonton 7300 or 7500. I purchased Amerimax vinyl windows in 2005 and I absolutely love them. I also considered Certainteed, Milgard and Window World – the WW were the least amount but looked cheap. The Amerimax were priced comparable to the Certainteeds and Milgards. Nice windows that make the house so much quieter and help with the utility bills. I would recommend the double hungs that tilt for easy cleaning. Amerimax window prices are in the mid range for a vinyl manufacturer. They are going to be more expensive than an Alside or Silverline, but less than an OKNA or Sunrise. Amerimax manufactures very solid vinyl replacements. Our home has 22 Amerimax single hungs, which we installed 5 years ago and so far so good. The frames are painted dark green on the outside and white on the inside and paint still looks good. They have even sightline and great night locks. They were nicely priced and also have a good window warranty. My wife and I researched windows for nearly a month before deciding on the Amerimax. I also considered Milgard windows, although didn’t love the single strength glass. We also looked at Atrium and Anlin, but weren’t excited about their warranties. The final company we considered was California Deluxe Windows – they make a good window but they were a bit out of our price range. For my money, Amerimax makes a great window at a fair price. I like the Amerimax vinyl windows because they have the AAMA color certification – unlike most vinyl products. They won’t take on a yellow tint over time (or at least they will do so much more slowly). I have them in my house for 7 years and they look great. They did have some color issues a while back when they used a vinyl that had a slightly bluish tint to it but they have since changed to a white. They should have ten parts titanium dioxide for the best color retention.